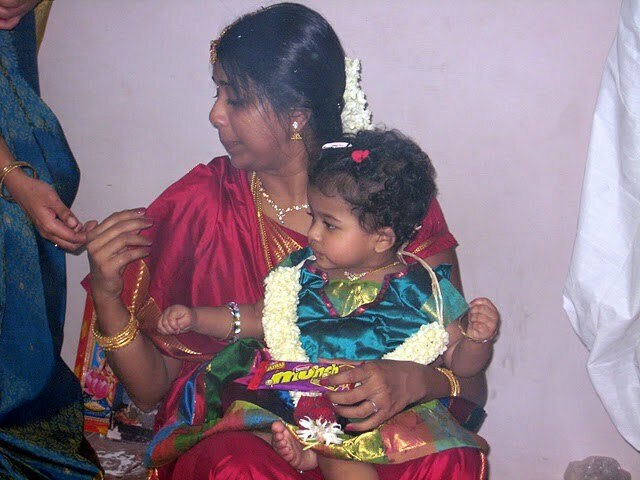 Another important event pending in our Chennai trip itinerary was her mottai ceremony. mottai – shaving her hair off from her head. 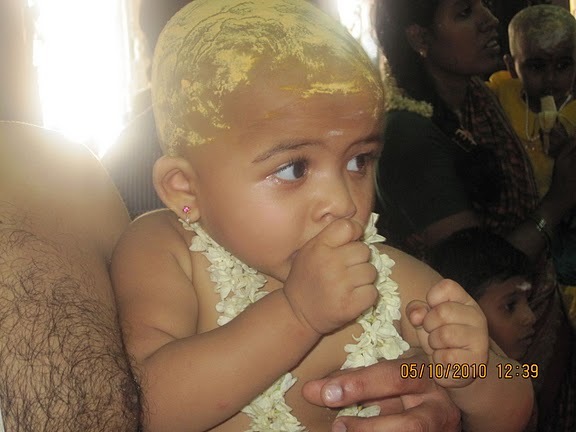 Traditionally, we shave off her hair after her 1st birthday @ our temple and offer it to the God. 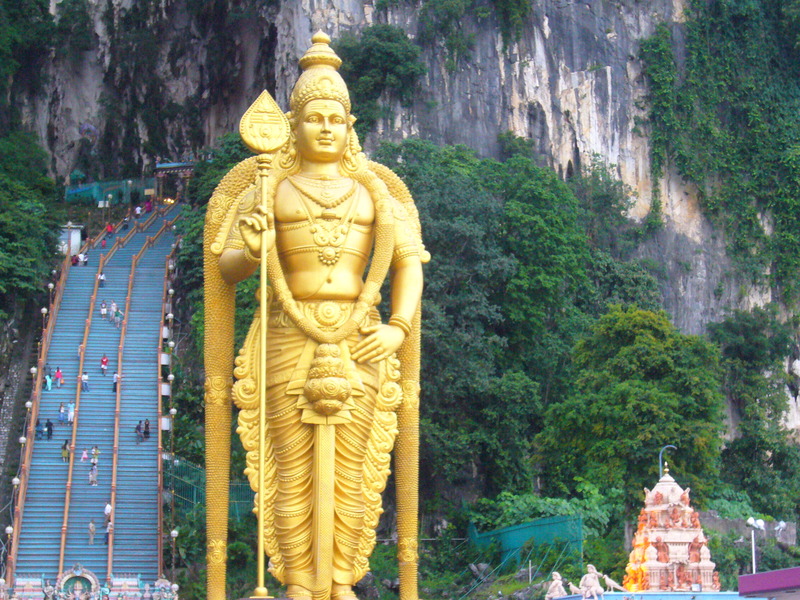 Since we didnt have much of time to spend @ the temple, and my bro and SIL had to head back to KL the same night, we planned our trip with a tight-packed schedule. Getting up @ 2:30 AM in the morning on May 10,2010 – yes, you heard me right, 2 30 AM in the morning 😐 I had a quick shower and got my lil one ready. I had packed her Diaper bag the previous night, so that we can leave the house to the temple in a calm, composed manner. Car arrived @ 4 30 – 4 45 AM and we all got in happily and headed to the temple with my IL’s, mom, bro and SIL and ofcourse, me, DH & lil darlin…On the way to the temple which will be close to 4-5 hrs travel time, we stopped in the mid to break for breakfast. And was happily chit-chatting about how she will look after her mottai 🙂 haha, And again, traditionally, she will have her hair shaved off by sitting on her mama’s (my brother) lap, we did have some funny talks about if she shakes her head, my bro’s ear might get chopped off and all that. 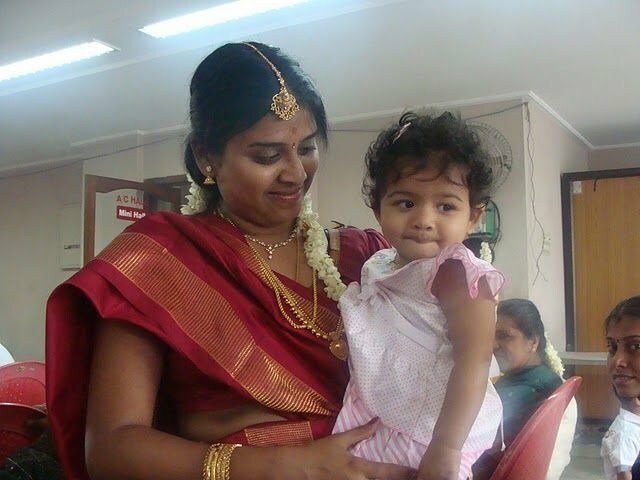 We had my little girl’s Ayush Homam on May 5, 2010 @ Sri Mahal, T Nagar, Chennai. We headed out to the function hall by 5 30 AM in the morning. Needless to say, Shriya was angry @ us for waking her up so early and a gangA-snAnam (holy bath by applying oil @ her head and washing her hair later) . As soon as we reached the hall, she got hungry and I fed her banana. Soon after that, relatives, friends, near & dear started to pour in to the hall and everyone wanted to hold her, play with her and spend some time with her. But poor thing was already sleepy and tired and hungry…and seeing all new people smiling at her, she got scared and cried non-stop. Shriya has learnt lotsssss from her vacation. 2. She learnt to drink juice/water from straw cup. 3. She drinks water from her Sippy cup. I’m still in a dilemma whether to call it a learning or wat. She sees this tiniest dirt in the kitchen (Yes I don’t maintain a clean kitchen :-P) and if I’m in the vicinity, she will hand it over to me and claps her hand (appreicates herself) when I say ‘Thank you’ , ‘Very Good’. But when I’m not around, she quickly puts it in her mouth and starts chewing it :-X 😀 How clever! KL city is indeed beautiful especially after dark. As the Sun goes down, the city is lit with lights and the skyline is an awesome sight to witness. As I mentioned earlier, I travelled alone (brave me) with my 1 year old and I patted myself on my back for the dare idea of 30-hr travel with a naughty baby. We went to Singapore for 2 days, 1 night trip. Thoguh it was pretty tiring and a packed one, I enjoyed a lot throughout the travel. And Shriya, though she found it little hard to manage the SGP weather (it was extremely hot) later on, she got used to that. I should mention that my daughter is pretty good in managing the situation/weather or whatever,,,such a darlin’ she is. Apr 23rd we left our house @ KL @ 5AM and got into the flight to SGP thru AirAsia. 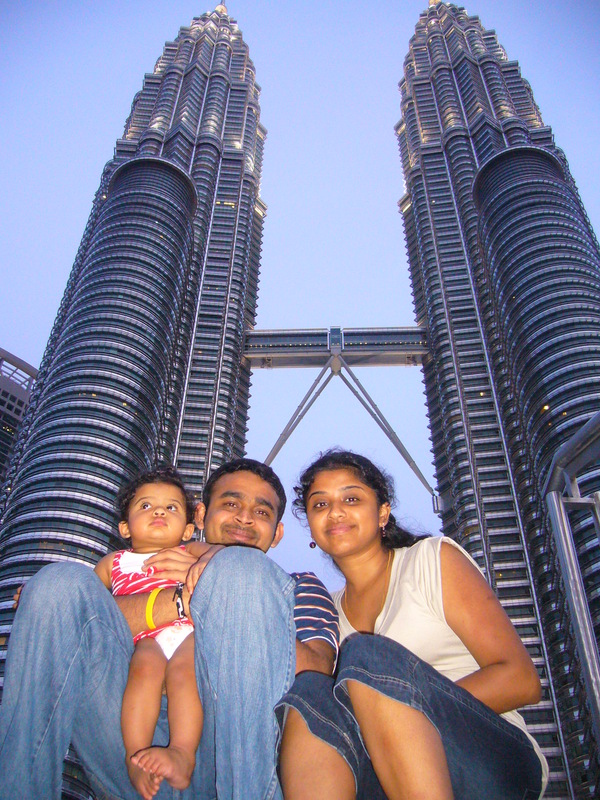 Thoguh it was a short 45 min flight, Shriya got cranky the minute the flight took off…After giving her a bottle, we started to enjoy our trip. After our immigration clearance, we took a taxi, checked in to our hotel and headed to Sentosa. We took the Mono-rail to Sentosa as the cable car was down for annual maintenance, little did I realise how hot it is going to be the rest of the day. We stopped to take pictures at the Merlion @ sentosa and headed to Imbiah Station. We took the sky ride where the circular box will rotate and show us the view of Singapore, and I went to Luge ride along with my SIL. We breaked for lunch in between and fed Shriya her lunch. After her tummy full, she dozed off in her stroller while I went to 3D Extreme Log Ride movie with my SIL 🙂 Shopped a little @ souvenir store. And by that time, Shriya got up. And she made a big noise when I tried to feed her oatmeal. I started receiving strange looks from people all over me. And I threw away the oatmeal and got very tired in trying to feed her food. She just cannot eat any solids, be it Gerber or Oatmeal…Finally stopped @ Coffee Bean, got some fresh warm milk for her, and wonder of wonders, she gulped it down :-O I was just worried, how hungry she was, but why wouldn’t she take the solids????? But thank god, atleast she had her milk. After changing her diapers and freshened up with another set of dresses, we were all set to go to next stop, Universal Studios. Yes, that was a new addition in Sentosa. But the tickets were very expensive and it was almost end of the day. We cannot do justice to the tickets we pay at that time and we had to skip so many rides…So we decided to call it quits and rather went to watch the Laser show, but mother nature sensed my call that I’m waaayyy too tired to watch it. 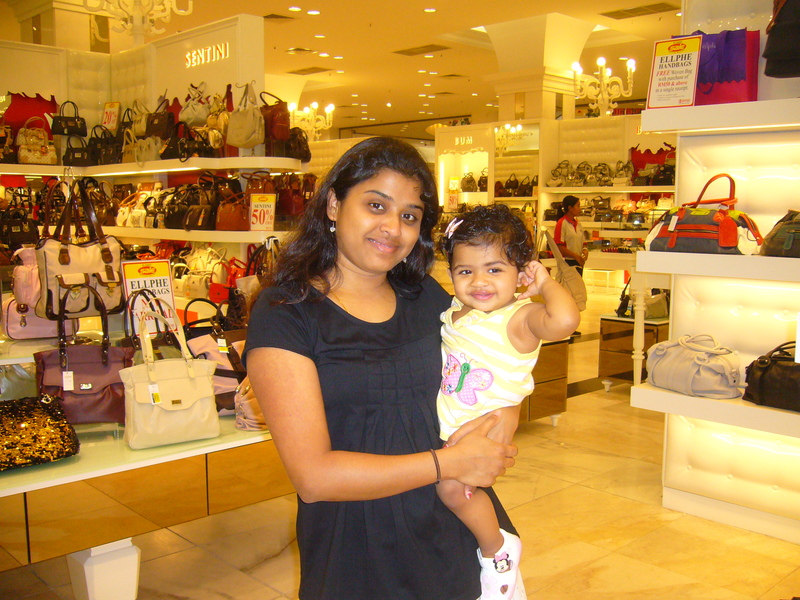 And with Shriya sleeping, we would prefer to head back to the hotel and we did the same. After a satisfied shopping 😛 @ the Jusco my brother said he will take me to a better mall the next day. And evening, after he came from work, we went to SOGO mall. I was taken aback by the size of the section they have alloted for handbags…Like a kid lost in a candie store, I walked through many sections of the handbags alone and finally spotted the one I like after a 40 minute search.